The world has become smarter and better about recycling, helping reduce the demand we make on the world’s natural resources and the amount of waste we create. We recognise the great value recycling has in helping us protect the environment by reducing the demand we place on natural resources and reducing the amount of waste we create that cannot be put to good use. We design our vehicles using parts and materials that can be used again, whether they are reprocessed for use in manufacturing, recycled, or used in a completely different way, for example as an alternative source of energy. We are required by European law to make sure our vehicles are at least 85% recyclable and 95% recoverable, but we go further to make this process as simple and efficient as possible. We use initiatives such as parts marking and active co-operation with specialist partners to discover even better ways of recycling the vehicles of the future. "Before you say you can’t do something, try it." When a vehicle reaches the end of its useful life, safe and efficient disposal ensures as much of it as possible is reused, recycled and recovered. We have been finding effective ways to recycle our vehicles since the 1970s, long before legislation made it a requirement. The current European Directive requires all car manufacturers to recycle their vehicles when they come to the end of their useful life, for example through accident damage or when they become uneconomical or technically impossible to repair. Because of their famous long-lasting quality, this can be at quite an age for Toyota and Lexus models. 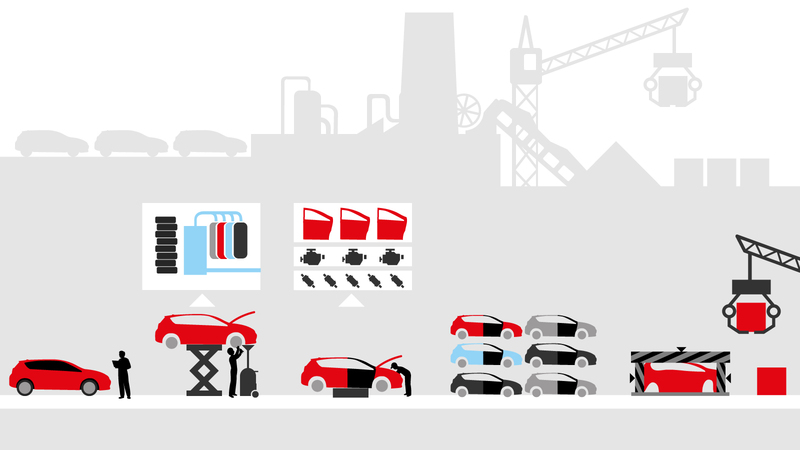 Since 1 January 2015, 85% of every vehicle must be reused or recycled, and 95% recovered. The process will identify parts that can be reused, such as engine, battery, alternators and steering systems. Fluids, gases and other materials and parts will be safely collected and, where appropriate, recycled. The stripped metal bodies are often then compacted and sent for shredding. 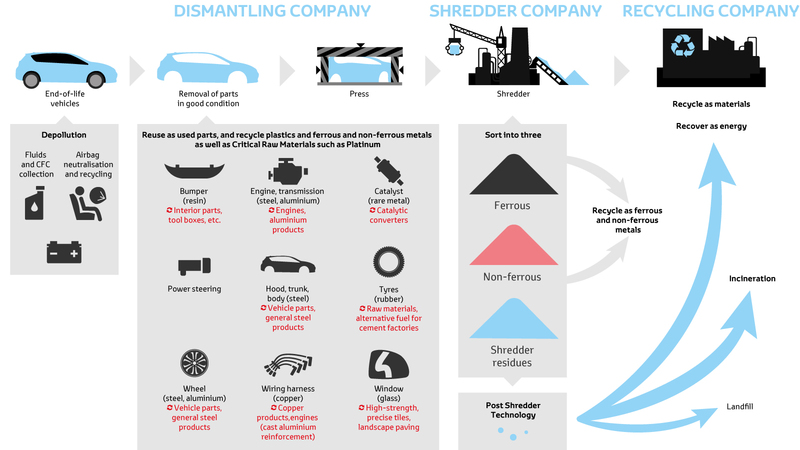 After this process, different types of metal can be extracted for reuse, leaving only a relatively small amount of residue. To encourage responsible and efficient vehicle disposal we have set up authorised dismantling centres across Europe where Toyota and Lexus vehicles can be taken for recycling. You can find out the location of these in your country and more about how to recycle your car using this link. Used tyres are a valuable resource for the cement industry. The Reuse and Recovery target for End of Life Vehicles as set by European Direction 2000/53. We are constantly looking at new and better ways of recycling, not just of the vehicles we make today, but those we will be offering in the future, too. As we introduce new technologies and new materials in our vehicles, we have to be sure that we can maintain or even improve the way in which they can be processed when they reach the end of their life. In response to the expansion in sales of our hybrid electric vehicles, we have already developed several world-first initiatives in Japan, including establishing a battery-to-battery recycling network for end-of-life batteries—which are expected to increase in volume even more in the future—and a vehicle-to-vehicle recycling system, as well as efficient dismantling technologies for the magnets containing neodymium, dysprosium and other rare-earth metals. These initiatives are also under investigation for Europe. In this way, Toyota will continue promoting cuing-edge initiatives in the field of resource recycling as well. We have worked with Groupe Comet, a specialist vehicle shredding company based in Belgium, on a trial project to dispose of 150 Prius Plug-in prototype vehicles that were used for a pilot car leasing scheme in Europe. We wanted to measure the effectiveness of the entire recycling process. The experience we gain can help make sure we can continue to meet the 95% recycling/recovery rate for future vehicles. The first stage in the process is depollution. This involves removing all the liquids, fuel and any potentially hazardous components, such as batteries and airbags. Next, any parts that can be recycled are removed, such as the tyres and catalytic converter. The dismantling continues with the hybrid battery being removed. In the case of the Prius Plug-in this is a lithium-ion type, using the same kind of power technology as a smartphone or laptop battery, so it is passed on to our specialist partner Umicore for processing. Prius Plug-In test vehicle being prepared for recycling. Making a vehicle easy to take apart when it reaches the end of its useful life helps reduce its lifecycle carbon emissions and also permits more efficient recycling of some of the useful materials it contains. We design our vehicles with dismantling in mind, for example by creating V-shaped grooves at the points in the bodywork where the instrument panel is attached, making it easier to remove. We also mark certain parts with an Easy to Dismantle symbol to show clearly where they can be most easily taken apart and sorted into different material streams for recycling. Best practice dismantling information is available via the International Dismantling Information System (www.idis2.com). The stripped car bodies move on to powerful crushing and shredding machines which reduce them to small fragments. The shredded material can then be processed to separate the different types of metal and non-metallic substances, such as plastics and glass. Most of this material can be reused in a wide range of industrial applications. We have even used recovered plastics from our vehicles to make picnic benches for our European headquarters! COMETSAMBRE metal recycling site in Châtelet, Belgium. The pilot shredding trial has achieved a 91.2% recycling rate for materials and 96.9% recovery rate, including energy recovery. These results show the 95% total target can be, and has been reached. This has been possible thanks to Prius Plug-in’s designed-in recyclability and the quality of the technologies and equipment used by Groupe Comet. COMETTRAITEMENTS Post shredder recycling site in Châtelet, Belgium. Plastic from our recycled Prius Plug-In test vehicles was used to produce benches for our head office in Brussels, Belgium. Our shredder trial test achieved 96.9% reuse and recovery. Our hybrid batteries are designed to last at least a vehicle’s lifetime, but when the time comes for recycling, we have an environmentally safe and responsible way of dealing with them. We are often asked if our hybrid batteries need changing, and if they damage the environment when they are disposed of. All the batteries we use in our hybrid electric vehicles are designed to last as long as the car, thanks to intelligent management systems that make sure they perform consistently, year after year. When they do reach the end of their lifespan, we have a take-back scheme to ensure they are dealt with safely and responsibly. Currently we are retrieving more than 90% of our batteries in Europe through our retailer networks, but our aim is to achieve a 100% take-back rate through all our operations. Umicore Battery Recycling facility, Hoboken, Belgium. If the hybrid batteries we take back cannot be reused, for example as a replacement battery in another vehicle or as stand-alone units to store power, we work with two highly accomplished and accredited specialist companies which carry out the recycling and disposal process. SNAM, based in France, is responsible for handling our nickel metal-hydride batteries, as used in most of our hybrid electric vehicles, and Umicore, in Belgium, deals with the lithium-ion batteries currently found in the Prius+ and Prius Plug-in models. They both use the latest, state-of-the-art techniques to recover as much material as possible and ensure that no harm is caused to the environment. Indicates the minimum level of recycling efficiency that shall be achieved for industrial batteries by weight. We go to great lengths to ensure any waste produced by our manufacturing operations is collected and recycled, with no risk of harm to the environment. We make sure we collect any waste produced in our manufacturing operations and treat it correctly, avoiding any damage to the environment. Using the right processing methods is key to this. 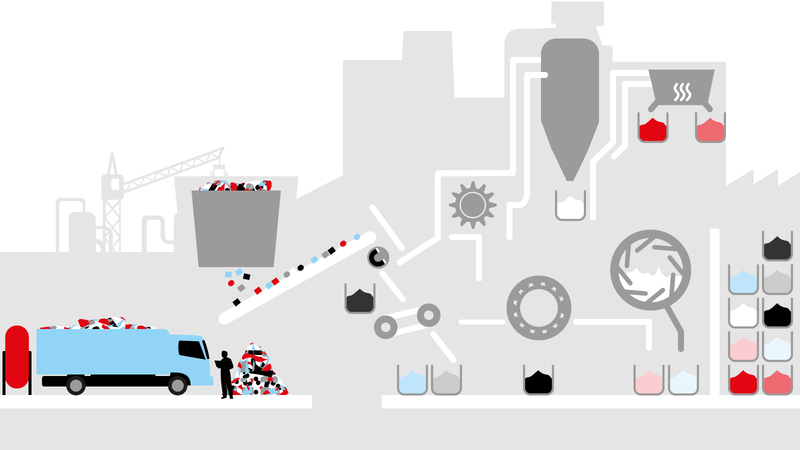 In everything we do at Toyota, we never pass on bad quality from one process to the next, and that applies to how we deal with waste as much as the way we run our production lines. If the waste can be sorted at the point where it is made, this makes it easier to handle at the recycling point. For example, waste plastic is sorted according to type and colour, so the teams from our waste handling partner, Green Metals, can easily send it on for recycling. Green Metals is a Toyota group company which supports our activities at 21 worldwide locations, sorting, processing and selling our metal and non-metal waste and operating a total waste management programme. Waste water from our manufacturing painting process can be used in cement factories. Phosphate sludge from our manufacturing painting process can be used in cement factories. Loose steel scrap received from the press-shop at Toyota Motor Manufacturing France. Steel scrap bales handled by magnet and overhead crane. Toyota Motor Manufacturing France. Fuel Cell Technology Fuel cell vehicles (FCV’s) are powered by fuel cell stacks, which generate electricity from a reaction between hydrogen and oxygen from the air. Life Cycle Action From design, through to production, driving and recycling, we take into account everything we use and manufacture to see how it impacts the environment and our health, through a 360º approach called Life Cycle Thinking. 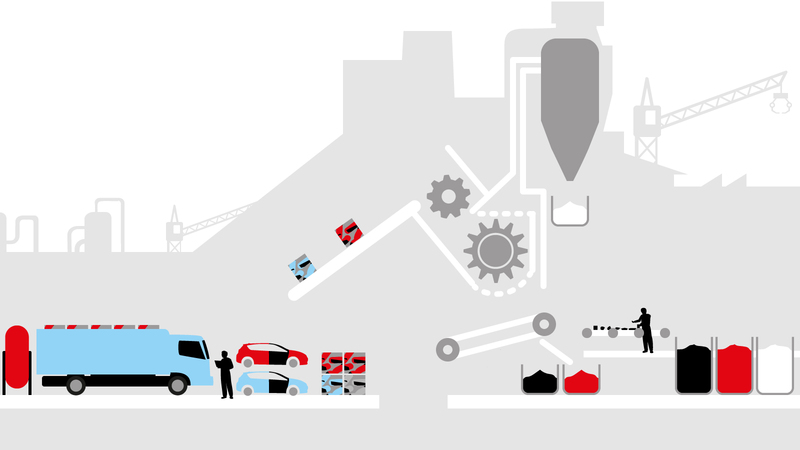 The Recycling Process As a manufacturer of vehicles, it is hugely important that at the end of our product lives we have considered how to reduce their environmental impact. We choose hybrid Around the world a growing movement of like-minded people that stands over 10 million strong is united in saying, we choose hybrid. Toyota Olympic and Paralympic Partnership | Toyota Europe We’re incredibly proud to announce our partnership with the International Olympic Committee and the International Paralympic Committee until 2024. Long-distance driving with Toyota Mirai - a hydrogen fuel cell car Europe’s network of hydrogen fuelling stations is continually expanding. In practice though, is it really possible to drive a hydrogen fuel cell car from northern Europe to southern Europe? Jacob Krogsgaard, CEO of H2 Logic, put it to the test with his Toyota Mirai. Toyota Mirai Awards We have a proud history of environmental achievements. Being the first to mass-produce the pioneering hybrid vehicles back in 1997, we have gone one step further by launching the Toyota Mirai... What is Hybrid? Discover how our Hybrids have been designed to make your life easier.